What’s your favourite game of all time? Any sort of game: board game, video game, card game, puzzle game, physical game, computer game, role-playing game, exit game, all sorts of other genres of game, whatever you like; compare your favourites from each medium against each other and pick a favourite. Too hard? You can narrow it down to four. My four, in no order: puzzle hunts at large, the live action RPG campaign I played in at university, obscure mid-’80s hybrid board/computer game Brian Clough’s Football Fortunes and The Cyberdrome Crystal Maze. You can probably have a reasonable guess, among other things, that I was born in 1975. This site has touched on the Cyberdrome Crystal Maze in the past without going into the detail it deserves. 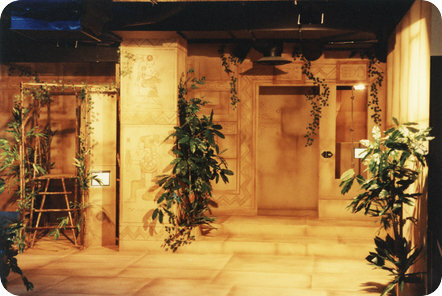 It was a physical attraction, based upon the The Crystal Maze TV game show, where teams raced from game to game about the centre, sending team members to play bespoke physical games or computer games where physical games would have been impossible. These were often as puzzling as the mental games on the TV show, or at least emulated the demands of one of the show’s physical games. It worked heart-breakingly well. The photo above is of the Aztec zone at the branch in Kuwana, near Nagoya in Japan. I wrote a longer piece about the game roughly half my lifetime ago, and will probably still have reason to write about it in another twenty years’ time. It’s the one topic that I’ve always wanted to write about on this blog but always shied away from for fear that I could not do it proper justice. However, failing that, here’s something rather special instead. Some detective work led me to the e-mail address of one Carl Nicholson, one of the founders of the Cyberdrome Crystal Maze – indeed, the technical side of the outfit. Mr. Nicholson extremely kindly agreed to answer some questions by e-mail; even better still, his partner in Cyberdrome, David Owers, whose focus was the business side, contributed some answers as well, and Carl has even got in touch with other members of staff. Huge thanks to all of them for their time, effort and responses, as well as for being the people behind a sensational game; it’s fascinating to hear more of the story behind the scenes.The questions asked by Exit Games (with grateful thanks to Dean for suggestions!) are tagged with EG; the responses are tagged with CN for Carl and DO for David. EG: What are your backgrounds and how did they lead you up to the opening of the Cyberdrome Crystal Maze? CN: I studied Physics at Oxford and David read Engineering at Cambridge. We met some years later at Cranfield Institute of Technology (now University) where we were doing Masters degrees in Maths and Engineering respectively. In the campus Social Club there was a computerised card/gaming table with upturned monitors and various pushbuttons accommodating up to four players. It occurred to me that it would be very popular if it could be networked with other tables. So the seed of networked interactive games was planted in my brain. I left Cranfield to start a career with British Aerospace as a satellite systems simulator programmer. David started his career with British Oxygen. After a couple of years I was head-hunted to Munich to work on test, training and distributed simulation concepts for Columbus, the European part of the International Space Station. After three years I moved back to the UK to work on the Advanced Robotics initiative. By this time the seed had grown to encompass not only games but simulators and trainers of all kinds, from physics experiments and financial market modelling to attractions based on blockbuster adventure films. This was the point at which I contacted David with a few spreadsheets and we arranged to meet for a camping weekend in the Welsh mountains. Thus was Cyberdrome born. Neither of us had heard of The Crystal Maze at this point and we had no idea which direction we should follow. David did a substantial amount of market research and persuaded me that interactive games was the way to go. But what precisely? I wanted to do Mad Max, Startrek, anything that required real simulation and modelling in a science fiction genre. David brought me back to earth again when we looked at costs and the difficulties of licensing anything from Hollywood. So we decided to develop a new games concept – Dragon Quest – and build a model to show prospective customers, investors and designers what we could do. Whenever we showed the model to people they said “Oh, you mean like The Crystal Maze”! So then we discovered The Crystal Maze and Chatsworth Television. We analysed the games and realised that it was not only possible but affordable to build an attraction based on this hit TV show. It remained only to convince Chatsworth of this and that we were the people to do it. DO: We met as students. Carl had ground-breaking ideas about multi-player games and I was keen to run my own company. EG: What were Chatsworth Television like to deal with? DO: Tough negotiators but over the years we got on well with them. CM was probably their most succesful project and we helped them get a bit more life out of it even beyond the TV franchising, although I think our licence fees were small compared to royalties from screening and repeating the TV show around the world. Equally though we were successful in Japan where the show was not screened at all. EG: How big an impact did the game make, first in Blackpool and then in your other locations? DO: The Blackpool Maze was very successful. On busy days we’d have well over 1000 people through the doors. All the other locations were also successful, but all attractions need refreshing. EG: What was it like to deal with the bowling alley operators and other companies in whose space your games were situated? DO: Good question! To be honest this was one of the aspects we enjoyed least. We were a small company with a new concept that needed a lot of development. The leisure companies just saw us as so many pounds per square foot rental. EG: How did you design the games that were featured in the various cells? 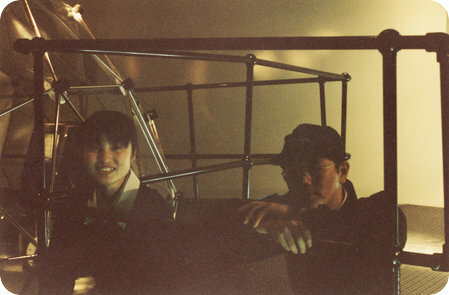 CN: Obviously the TV set was the starting point. But there were major differences between providing a weekly show for television and a creating a private experience for fee-paying members of the public. These differences were resolved by incorporating a high degree of automation and robustness, satisfying planning and safety regulations and compressing into an affordable and manageable space. For copyright reasons Richard O’Brien was replaced with an on screen guide called “Merlin” who explained how to play the games and issued various encouraging and sarcastic remarks. Some games were based on those in the TV show, modified to remove the need for staff intervention. Other games were invented by us or developed with a games software company called Level 9. EG: An article about you in the Independent in 1994 suggested that you planned to replace more of the screen-based games with physical games. What did you have in mind? DO: It was clear that the physical games were more enjoyable to most players. Also we didn’t want to be a “computer games” company but to develop something much more realistic, physical and naturalistic. If we could have guided people without computer monitors, trackballs, swipe cards and buttons, concealing all the “intelligence” behind natural scenery we’d have loved that. With today’s technology you could get a lot closer to this ideal. The reason we had only 25% physical games was purely cost. They took up more space and were costly to build and maintain. EG: How did you balance the need for games to be interesting against the need for them to be physically achievable? DO: They’re not opposites! However we had to think about repeat business and therefore we invented three “difficulty” levels. At the higher levels the games introduced new elements so experienced players always got new and surprising challenges. You had to go round thirty or forty times before you’d really “done” all the games. EG: What influence did health and safety regulations have on what you were able to achieve? DO: We got professional advice from the outset and it’s all pretty common sense. A few people (bear in mind over a million played the Cyberdromes) claimed for cuts and bruises and we normally “settled” at £50 – £100. One leisure company Managing Director fell off a rope when he came to evaluate the Maze as a commercial opportunity – he sued us for loss of salary while he was off work “recovering”! Sad. But the vast majority of people are reasonable, friendly and understand the level of risk. EG: Were there games (or, alternatively, parts of the labyrinth design) that you would have liked to have had that you had to abandon? DO: We would have liked to have scarier dungeons, higher ledges, and water features but these are not practical in an indoor family attraction with 100 people in it and only a few staff. EG: What were you most satisfied about with what you were able to achieve? DO: Well Carl’s concept of managing complex flows of people rounds a small maze using a network of PC’s worked brilliantly virtually “out of the box” (yes, of course we had teething trouble with the software and hardware). 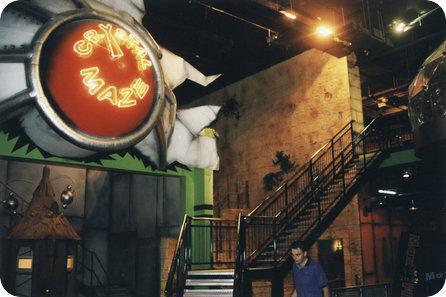 The system gave over 100 people an hour a thirty minute experience which they felt to be personalised and (which was) unique, without any queueing for games or downtime during which the adrenaline could drop. EG: It’s hugely impressive that you managed to spread the Cyberdrome Crystal Maze around the world to countries where English is not the first language. Did the show have a big following around the world? DO: Not at that time, no. It was not even shown in Japan. But it worked as an attraction because the technology allows the creative guys to deliver such a “different” experience. EG: How did players in Japan and Dubai differ from players in the UK? DO: Generally the same – ie family groups. However in the UK you do get the drunk “lads” and to a lesser extent women who show less respect to the staff and to the environment. It goes with the territory and is not so bad as to be unmanageable. EG: The Crystal Maze was closely related to the Fort Boyard TV show, still on the air in France after 25 years and in a few other countries as well. Was there ever any interest in applying your capabilities to Fort Boyard in countries where that was popular? DO: We were not approached. EG: What was the player demographic like? DO: Overwhelmingly family groups, students and twenty-somethings. EG: What were the biggest problems you faced? DO: Financial. It was very expensive to build and so we never had enough to develop the concept and take it to the next level. EG: How problematic was maintenance? DO: With a good operations team, totally manageable. Technology would make it easier today. EG: Which technologies that were invented later on do you wish had been available at the time? DO: The Wii gyroscopic technology together with smartphone interfaces would enable much cheaper, physical challenges. VR was being developed in the 90’s and is still much vaunted, but was neither good enough nor cheap enough at the time. EG: Did you notice major changes over time in how well your sites were received? DO: In the UK, Crystal Maze went off the boil in about 1995 and that inevitably had an effect on our sales. EG: Was it a big headache for you when you heard that The Crystal Maze were replacing the Industrial Zone with the Ocean Zone? EG: I have a feeling that your games were ahead of their time; video games were still a large minority interest in the early ’90s and play in public was still largely restricted to traditional forms. What sorts of activities did you see as your biggest competitors, and how did your competitors change over time? DO: Laser games were a more attractive investment for the major leisure companies. Simple technology, very cheap arenas and a good steady demand from “shoot-em-up” enthusiasts. Crystal Maze arenas cost twice as much but could not generate twice the profit. EG: Do you believe the attractions, in a modern form, could still be a commercial success if a new series of The Crystal Maze were ever made? DO: I don’t think it depends on Crystal Maze, I would advise anyone looking at this field to develop their own format and branding. EG: Knowing what you do now about running your business, if you had your time all over again, what (if anything) would you do differently? DO: Very little. I could say be more realistic about costs and more generous with marketing and development budgets, but if we had, we would never have got initial funding. EG: If you could give the puzzle fans reading this one piece of advice, what would it be? DO: Get a life. Well, no that’s a little unfair 🙂 But use puzzles as a means of meeting other people, not just an “online community”. Enjoy the artistic side of them as well as the technical. If you want to build a maze, make it with flowers and trees, not MDF and plastic straw bales. EG: Lastly, are there any photos or videos that you could share? Work Zone, Bristol (my bedroom) where we designed and built the Blackpool Crystal Maze computer system and associated hardware. Barry Keepence was the original Cyberdrome software engineer. He designed and programmed the central controller and got all the network stuff working. He subsequently shot to stardom as CTO of IndigoVision. It would be interesting to get his side of the story, if you can find him!! I [Carl] took over the Central Controller from him [Barry] when he left. Before I even got started, Level 9 [the Games programmers] ] had installed new versions of the CC and Dome at Blackpool, incompatible with all others (by changing the structure of one of the network packets), with a software timebomb which broadcast messages randomly on the games demanding “Please pay the programmers”. Then it would cease to function after a certain date. I found and fixed the new “features” in the CC and re-installed an earlier version of the Dome. We paid them when we could of course, but it took a little while. Scary times! Chris Dunning joined as a hardware and software engineer in time for the Southampton maze and stayed till the Honmoku maze was finished. He developed a games system independently of Level 9 which allowed us to program our own games. He also developed a system similar to USB for controlling our hardware – we were simply years ahead! 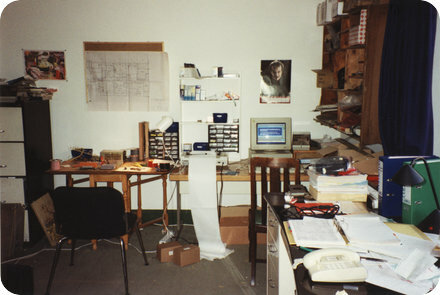 Tim Mann joined Cyberdrome as hardware/software engineer in about ‘94 when we were doing the Coventry Crystal Maze. He helped with the development of new systems and games and was instrumental in installation and maintenance activities. Tim and I effectively did the whole [computer] system for Dubai between us, because Cyberdrome had all but shut up shop. We are still friends. Tim’s CV listed “growing my hair” as one of his hobbies – how could I not hire him? Many, many thanks to the team for creating a truly remarkable game and for spending their time and effort in this interview with us. The game still crops up in discussion from time to time and it’s very clear that it wasn’t just me for whom the game had a massive impact. One of a kind; sadly gone, but never to be forgotten. Nice one, but quick note, I think you’ve miscopied an answer fifth question up from the bottom. Good catch, thank you! Corrected now, making the interview even better still.